cap is up to 11 cm broad, convex, medium to dark brown with reddish/pink cracks and damaged pink patches. older specimens have a flatter cap with deeper cracks. underside of cap has yellow pores that bruise blue. flesh is whitish, may be reddish near the skin. 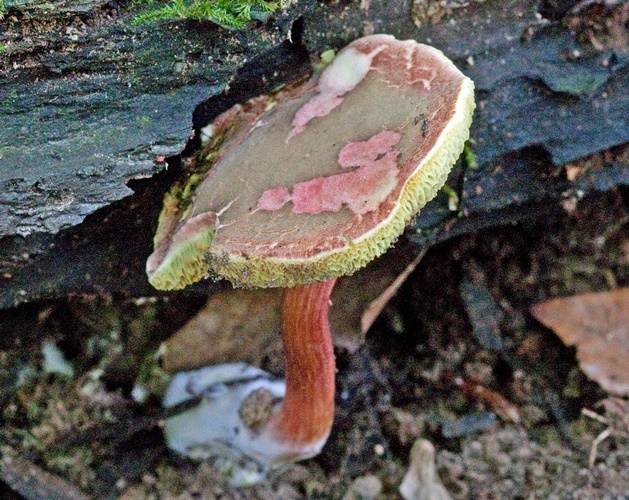 stem is dull yellow, possibly streaked red, often curved, with flesh that slowly bruises blue when cut. appears in the spring, summer and fall. grows either alone or in numbers in association with conifers and hardwoods. has a mild taste with no odor; cook before eating.